The club runs several meets throughout the year which are open for general entry by other clubs as well as our own swimmers. As well as giving opportunities to swim they are also a good form of income for the club. Everyone in the club can get involved in these meets from helping to organise to helping on the day. As well as officials such as timekeepers and judges we need general help with marshalling, taking ticket money, organising the tombola, posting results and taking water round to the officials on poolside to name but a few. Swimmers not swimming in that meet can also help. The income from these meets help to keep your fees down so please get in touch with the secretary or watch out for emails asking for help. Held at the end of February or the last Sunday before SNAGs (Scottish National Age Group Championships) entry closing date. As the name implies this meet is aimed at swimmers who are just outside qualifying times for SNAGs and gives them one final chance to meet the times before entries close. This attracts a large entry of swimmers from the East District and beyond. Usually held at Bathgate Leisure Centre. Held on a Sunday in mid May. This meet is aimed at swimmers across all the TaSK squads who don’t have much competition experience. 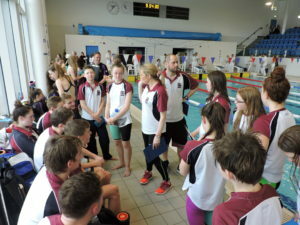 This is a friendly meet giving young swimmers the chance to gain race experience. Usually held at Prestonpans. A two day meet held in early October each year for swimmers aged 14 and under. This meet provides swimmers from all across Scotland (and beyond) a chance to race over 50s/100s/200s. It attracts clubs from outside the East District so gives our swimmers a chance to compete against different swimmers. In the past we’ve had teams from Aberdeen and Gateshead travel to the meet. Usually held at Prestonpans. An internal meet for registered club swimmers only. This is one of the few opportunities for the whole club to come together and compete on the same day. There are races across all strokes from 50 to 200 across a number of age categories, plus 400 free and 200 and 400 Individual Medley races. There is also an 800 free for the girls and 1500 free for the boys usually run on separate nights. There are a number of trophies to compete for which are presented at the club celebration night in November. The club championships are held at the end of September each year. A fun day with a competitive element! Each stroke is raced over 25 metres with all four times being combined to produce an overall Individual medley time for each swimmer with a winner declared for each age group. There’s also 9 and under IM trophy for boys and girls to compete for. If time allows one big relay race involving the whole club finishes the day. Another great chance for the wee swimmers to watch the big ones swim and for the big swimmers to cheer on the wee swimmers. A good chance for parents to get involved too – you’ll see more from the poolside than you will from the spectator area. A tea and bake sale is held too.